As if I haven’t been getting enough lovely things in the mail lately, I got a chance to try out a new food-related subscription box service. Hamptons Lane selects artisan foods and kitchen tools and creates themed boxes every month. Although I love browsing through kitchen stores as much as any other cook, there’s certainly an appeal to curated collections – they help you discover items you might not have known about or otherwise considered trying. And I love getting surprises in the mail. So when I was informed that the theme of the August box would be Ice Cream Sundae Bar, I decided what better time to try it out? Sweet Treats Ice Cream Tub by Tovolo: I have some of Tovolo’s products and find them cute and modern. 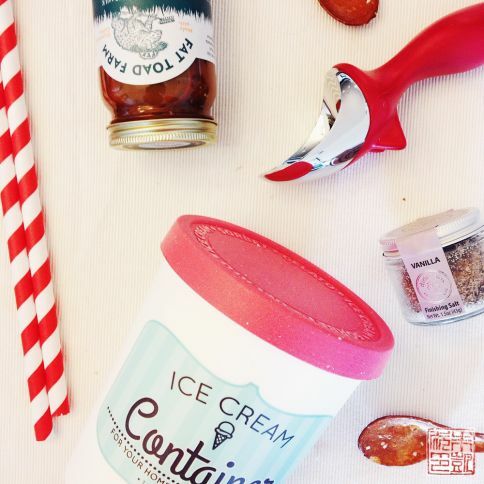 This take on the traditional ice cream quart containers is made of silicone, protects your homemade ice cream from freezer burn, and makes a great prop. Stumptown Cold Brew Coffee Caramel from Fat Toad Farm: This was probably my favorite item in the box. Fat Toad Farm makes this caramel by hand with goat’s milk from their own herd. The caramel is just the perfect thick, syrupy consistency and the coffee flavor really comes through and cuts through the sweetness of the caramel. Striped Paper Straws by Kikkerland: You can’t make a milkshake or lemonade these days without seeing a stripey straw. I like that these are extra large and the package says they should last up to three hours in a drink. Tilt Up Ice Cream Scoop by Tovolo: Another gadget by Tovolo, this ice cream scoop has two little metal feet so you can prop it on the counter without the scoop getting dirty. There can never be enough ice cream scoops in my kitchen (I use them for all sorts of purposes like scooping cookie dough), so I appreciated this. Vanilla Finishing Salt by Didi Davis Food: The sweet-and-salty trend doesn’t look like it’ll go away anytime soon, so this salt is a lovely choice to add a bit of salty crunch to desserts – and works for savory dishes, too. Edible Pretzel Spoons by Foodiespoon: The notes in the box said that these are typically a specialty item made for caterers or restaurants, but Hamptons Lane members get special access to purchase these on the site. Another option to add a bit of savory contrast to your ice cream, I thought these were a cute novelty – and they photograph adorably, as well. All told the value of these items is about $64. Hamptons Lane costs $45 a month and you have the option of opting out of a box after the theme of the month is revealed. This is definitely a high-quality subscription box, and I really like the choices of product and the planning that went into the theming. These boxes would also make good gifts for the culinarily inclined in your life. The information card in the box comes with several recipes to help inspire you in making your own sweet treats. They were not sundae recipes but more creative, like caramel and ice cream chocolate cups and salty chocolate cookies, so instead of just doing an ice cream recipe as well I decided to do something a little different as well. This malted milk Bavarian cream captures the old-fashioned meets contemporary vibe of this box. 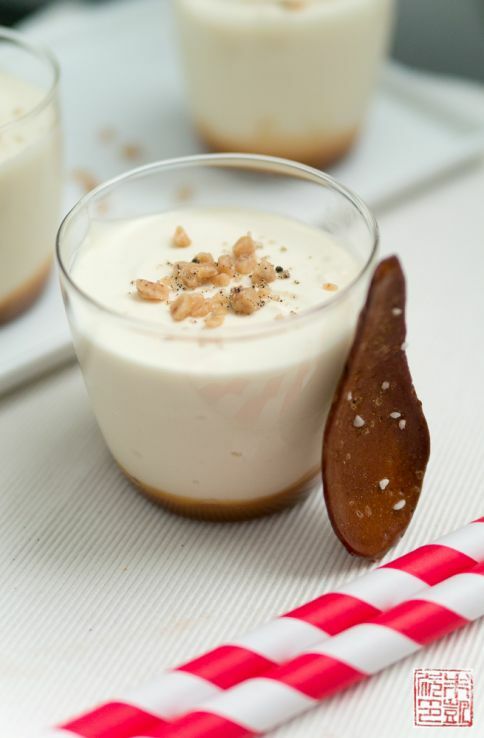 It’s a take on the classic ice cream float crossed with crème caramel. I knew I wanted to use the Fat Toad Farm caramel, so I drizzled some of the bottom of dessert glasses as a “hidden” surprise for the careful scooper. 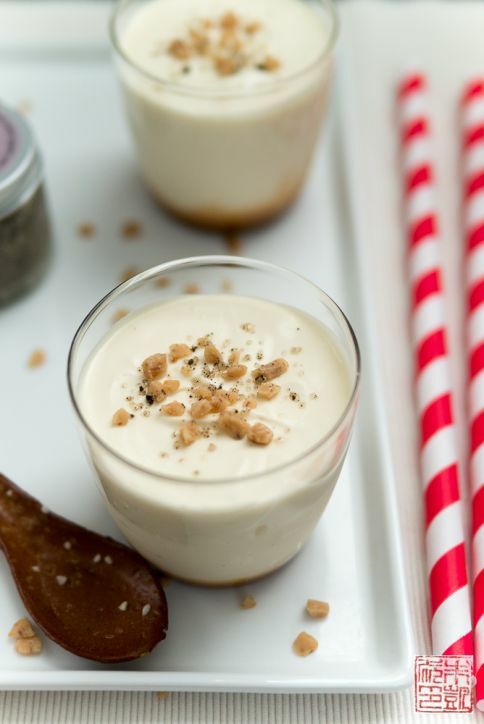 The main part of the dessert is a malted milk Bavarian that complements the coffee and caramel flavors. I didn’t use any chocolate because I didn’t want it to compete with the caramel, plus I really wanted the malted milk flavor to shine through. The Bavarian is chilled, like ice cream, but the lighter, more mousse like texture makes it more ethereal and elegant, perfect for an after-dinner presentation. To take the ice cream shop feel further I sprinkled toffee bits over the top (you can also swirl it into the Bavarian before it sets). A sprinkle of the vanilla salt gives it that final whimsical fillip. You can use the pretzel spoons to eat it, or a regular spoon will do just fine. Thanks to Hamptons Lane for helping inspire this recipe! I was gifted a box from Hamptons Lane for my review. All opinions in this post are my own. Place water in a small bowl and sprinkle the gelatin evenly over it. Set aside. Combine half and half and malted milk powder in a medium saucepan. Bring to a boil, stirring to make sure the powder fully dissolves. Meanwhile, whisk the egg yolks and sugar together in a medium metal bowl. Pour about half of the hot half and half into the egg yolks, whisking constantly to prevent the eggs from cooking. Pour the egg mixture back into the saucepan and return to the stove. Cook, stirring constantly, until mixture thickens and coats the back of a wooden spoon. Remove from heat. Add in the gelatin and stir until it is melted and fully incorporated. Place the bowl into an ice bath (a larger bowl or a tray filled with ice cubes) and let cool to room temperature. Whip the cream to soft peaks. Carefully fold into the Bavarian mixture. 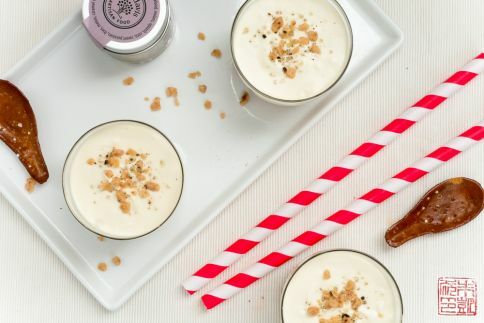 Pour some caramel sauce into the bottom of six dessert glasses. Divide the Bavarian cream among the glasses, filling almost to the top. Cover and refrigerate for three to four hours until set. Sprinkle with toffee bits and vanilla finishing salt before serving.